Academics are critical, but so is a child’s social and emotional development. Strong academics will always be central in Delaware schools. But in a rapidly changing world, it’s becoming increasingly important that young people receive a holistic educational experience that maximizes who they are as individuals—one that instills skills like communication, collaboration, critical thinking, empathy, and creativity. Physical and mental health, nutrition, and exposure to the arts are also huge factors in the development of young people. This is true of all children, and particularly those who come from challenging backgrounds and who have experienced trauma. This concept of developing “social and emotional learning”—a phrase that’s often cross-referenced with “whole child”—is not a new one. Generations of educators have said that the so-called soft skills mentioned above are all important ingredients in child development. Employers are saying the same thing. In Delaware, it’s exciting to see a renewed focus and collaboration on social-emotional learning. 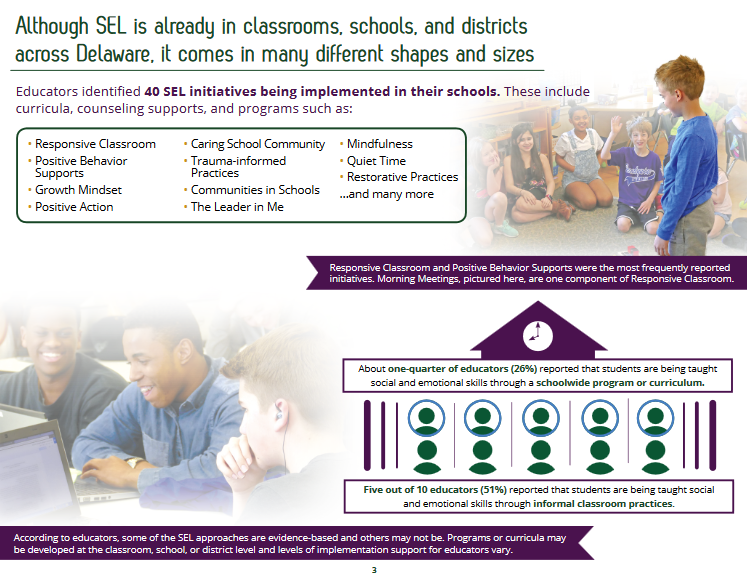 The following resources combine national and state data and initiatives underway in order to inform ongoing conversations about SEL in Delaware. This list is not comprehensive, and this is not an endorsement of any specific initiatives underway. Creating A Common Language for Social and Emotional Learning in Delaware (Rodel Teacher Council, 2017): Teachers agree that SEL is critically important to their classrooms and they want a toolkit to better support students’ social and emotional needs. This brief, based on national and local research, is meant to serve as a resource for educators, districts and charters, and anyone interested in learning more about how to intentionally integrate social, emotional, and academic development. Educators Speak Up: Social and Emotional Learning in Delaware (Rodel Teacher Council, 2017): In order to better understand the beliefs and perceptions of educators on SEL, members of the Rodel Teacher Council surveyed more than 200 educators, representing pre-k through 12th grade, novice and veteran educators, from every school district in Delaware, including vo-tech and charter schools. What are the Social and Emotional Needs of Students? 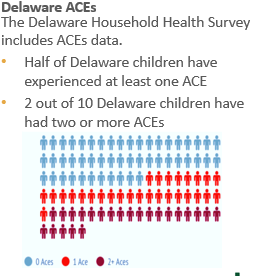 Adverse Childhood Experiences (ACEs) Among Wilmington City & Delaware’s Children. (Data Resource Center for Child & Adolescent Health, 2016): This brief offers both a focused look at trauma in the city of Wilmington and across the state. 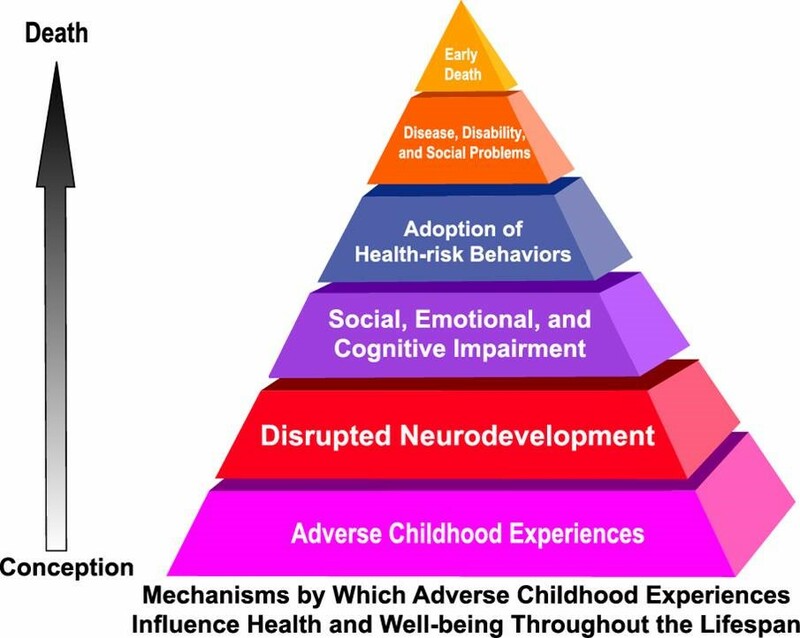 It takes the data and puts into perspective exactly what these ACEs mean for kids’ development. Child and Health Measurement Initiative (National Survey of Children’s Health, 2012)—Both Delaware and national data measurements from student engagement to healthy behavior are covered in this survey. Using Social Determinants of Health Data to Improve Health Care and Health: A Learning Report. (Robert Wood Johnson Foundation, 2016): This report explains how the social determinants of health—the social and environmental factors that influence physical, mental, and emotional wellbeing—can be used to inform social services and health care systems. Delaware School Survey (University of Delaware, 2015): Students across the state offer their perspective on school climate, safety, substance abuse, and more in this annual survey of fifth, eighth, and 11th graders. CASEL District Resources Center (CASEL, 2017): The District Resource Center (DRC) offers guidance, tools, and resources for Social and Emotional Learning (SEL) implementation throughout a district. It contains 500+ tools and artifacts used in the 10 districts across the county collaborating with the Collaborative for Academic, Social, and Emotional Learning (CASEL), the leading organization dedicated to advancing research and evidence-based practice in social and emotional learning (SEL). Social and Emotional Learning: Why Students Need It. What Districts are Doing About It. (NoVo Foundation, Education First, 2016): In this publication, the NoVo Foundation highlights SEL successes in three leading school districts—Anchorage School District (AK), Bridgeport Public Schools (CT), and Sacramento City Unified School District (CA). Measuring Social and Emotional Learning (Rodel Foundation, 2017): From student and parent surveys to performance exams, this one-pager offers an overview of some of the ways social and emotional skill attainment is measured. Parent Toolkit (NBC News Education Nation, 2017): Check out the social and emotional development tips for every grade level. Student Success 2025 (Vision Coalition, 2015): The North Star, which illustrates the traits Delawareans believe are necessary for success, includes academics alongside social and emotional learning, and guides the recommendations of this 10-year education plan. Hear what students have to say in about the social and emotional skills they will need to be successful. Social and Emotional Learning archive (Rodel Foundation of Delaware): See every previous blog and newsletter published related to SEL, including: How the “Whole Child” Approach is Transforming Education in Delaware (Rodel blog, 2017): This blog offers a more in-depth look at some SEL work underway in the Delaware—and ways you can get involved. 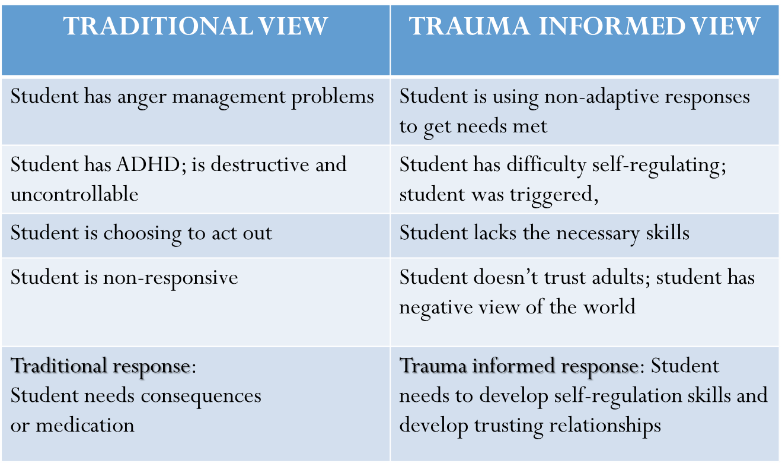 Compassionate Schools—A Compassionate School uses trauma-informed care, multi-tiered supports (such as Positive Behavior Supports) and data to promote self-care among staff and a supportive school environment for students. While it benefits all students, a Compassionate School focuses on students chronically exposed to stress and trauma. Responsive Classroom—An evidence-based approach to elementary and middle school teaching that focuses on the strong link between academic success and social and emotional learning. Positive Behavior Supports—PBS is coordinated, data-based decision-making and instructional programming that focuses on teaching adaptive behaviors and discouraging disruptive behavior. The Leader in Me—This program teaches 21st century leadership and life skills to students and creates a culture of student empowerment based on the idea that every child can be a leader. CDC Community Advisory Committee—This advisory council, composed of community stakeholders provided a series of recommendations on preventing youth violence and promoting positive youth development in Delaware. Delaware Center for Health Innovation: Healthy Neighborhoods Committee– The Healthy Neighborhoods initiative is about creating sustainable interventions by convening local stakeholders to improve health in their communities. IM40—In a statewide partnership that includes United Way of Delaware and AstraZeneca, over 50 youth-serving organizations have adopted the 40 development assets, skills, and behaviors that enable young people to develop into successful and contributing adults. Nemours offers resources on improving social and emotional health through child care policy and promoting children’s emotional and behavioral health in early years. Prevent Child Abuse Delaware—Promotes protective factors to eliminate the risks to children’s wellbeing and health. This includes practices and programs that strengthen families, address trauma and support resilience.